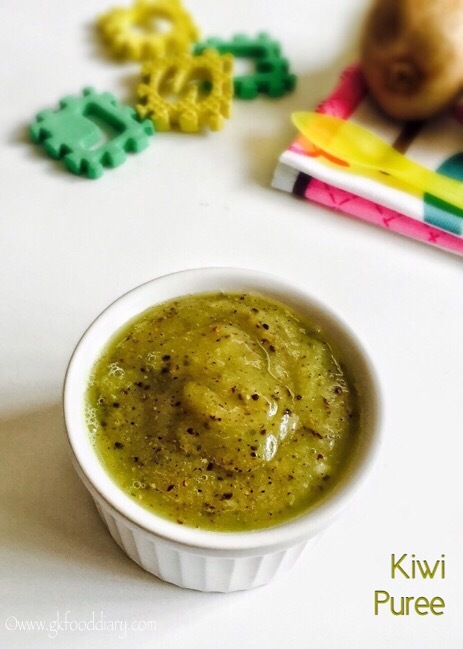 Kiwi Puree Recipe for babies – Kiwis are loaded with vitamin A, Vitamin C, antioxidants, potassium and folic acid, which makes a great healthy food for babies, toddlers and kids. Kiwis are also a great source of dietary fiber. Kiwi is less allergenic in nature but the acidity of the fruit may not be digestible if the baby has sensitive tummy, so it may lead to mouth rashes or diaper rashes in some babies! Hence if your baby has episodes of tummy troubles, check with your baby’s doctor and include this fruit in your baby’s diet! Kiwis are little acidic in nature and hence its ideal to introduce kiwi for babies at 8 months of age. 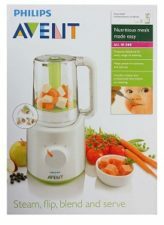 When you introduce, you can offer pureed or mashed kiwi or cut kiwi into tiny pieces and offer as a finger food if your baby can handle the same. 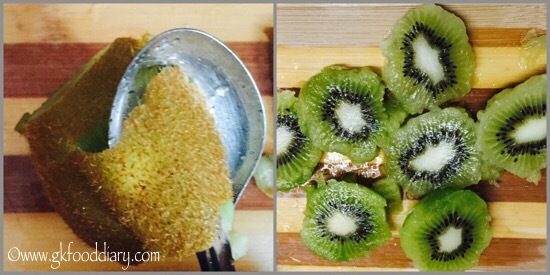 The tiny seeds of the kiwi is completely edible and hence its not necessary to remove the seeds. 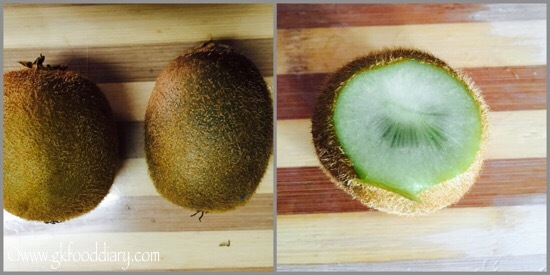 Look for a kiwi fruit with the skin not bruised and no visible indentations. Choose only ripe kiwi for baby food. The ripe kiwi is with flesh that yields slightly to pressure. Also a ripe kiwi fruit should have a fragrant citrus smell. 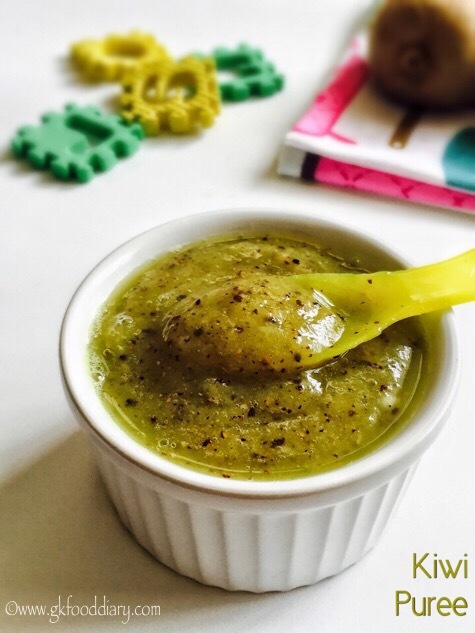 Here is how to make kiwi puree recipe for babies. Wash the kiwi in running water thoroughly. Place it on a cutting board and slice off both the end of the fruit. Insert a spoon in between skin and flesh of the kiwi fruit. Rotate the spoon around the fruit and pop the fruit from the skin. Then slice the fruit vertically or horizontally. Then take the chopped chopped kiwi pieces in a blender. Blend everything till smooth.No need to add water. 1. Wash the kiwi in running water thoroughly. Place it on a cutting board and slice off both the end of the fruit. 2. Insert a spoon in between skin and flesh of the kiwi fruit. Rotate the spoon around the fruit and pop the fruit from the skin. Then slice the fruit vertically or horizontally. 3. Then take the chopped chopped kiwi pieces in a blender. Blend everything till smooth.No need to add water. 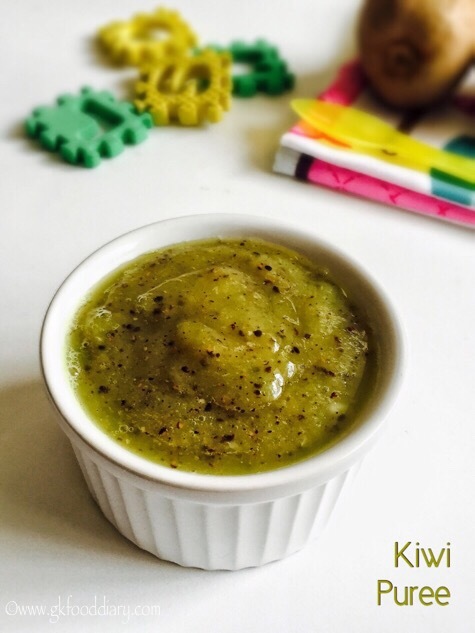 The Kiwi puree is ready to feed your baby! No need to add water while grinding if the kiwi fruit is well ripened. 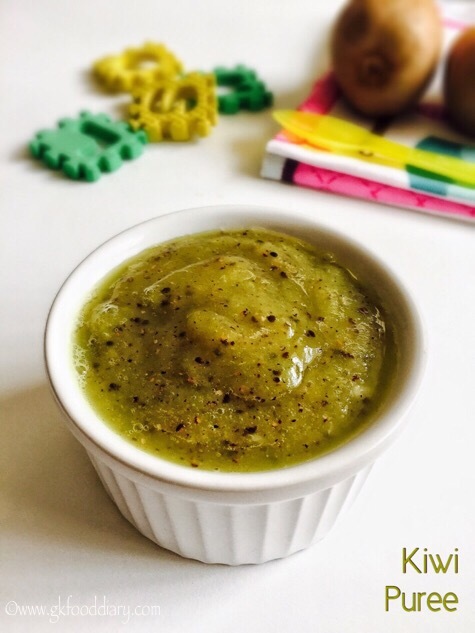 You can add pureed banana or apples to this kiwi puree if your baby does not like plain kiwi puree. 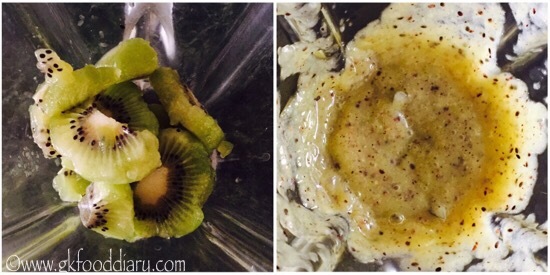 Instead of blending them, you can also mash the kiwi pieces using a fork or masher. Some kiwi fruits can make the baby’s mouth tingle a little bit. In that case, give water.